Allow users to export OLM file to PST, EML, and MSG. Bring preview of all emails along with attachments to the users. Provide easy migration from Outlook OLM archive to PST. Export Outlook Mac emails, contacts and calendar to PST file. MS Outlook is needed while migrating from OLM file to PST. Microsoft corporation developed Outlook which is available in different versions like 95, 97, 2000, 2002, 2003, 2007, 2010, and 2013. It is personal info manager and part of MS Office. It is used as emailing platform which supports providing help via elements like emails, contacts, appointments, journals, to do list, tasks, note taking, etc. It is a stand alone application which can conveniently work with Exchange server and Share-Point server in a large organizational environment like shared appointments, and mailboxes, Exchange public folders, meeting schedules, calendars etc. There are third-party add on tools which gets integrates Outlook with plenty of devices such as Blackberry mobile phone and other different platforms like Office, Skype Internet etc. Developers have ease of creating their own custom software which can work with MS Office components with the usage of Microsoft Visual Studio. Windows mobile devices can synchronize Outlook data to Outlook mobile. Extract Emails| Contacts from OLM to PST: With Outlook Mac Exporter, user could be able to easily extract emails, contacts and calendar entries from OLM to PST file format. To do it, they only need to choose the require option to proceed. Convert OLM to PST, EML, & MSG: This is one of the major advantage of this tool, by which one can effortlessly export OLM file to Outlook PST, MSG, and EML format. All they need to select the require options according to the preferred file format, they wish to convert into. 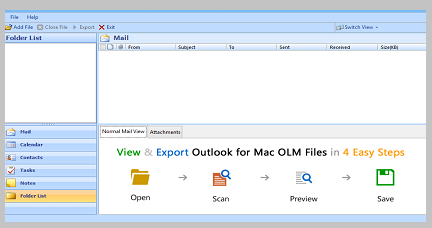 Mass Export OLM to PST: Once after grabbing full license of the tool, you can efficiently use OLM File Exporter and perform the conversion in bulk between Mac Outlook OLM and Windows Outlook PST file. Extract Items by Selection: The software will also let the users to export the items available in OLM by making a selection. After doing this, only those items will be migrated into three different format which you have selected. By utilizing this feature, one can perform migration simultaneously. Save report after Scan: After downloading the OLM to PST converter tool, once you run the software and click on â€œAdd Fileâ€ (to add those file that you wish to export), the Outlook Mac Exporter tool will automatically start a scan process. Apart from this, the tool will also generate a complete report for the same, which you can save to your preferred location. For fewer Mac Outlook emails, contacts, calendar, journals, tasks, attachments, and all other items to migrate into Windows Outlook PST file, you can download free OLM file exporter and run with flexibility. For numerous OLM file that are large in size, the demo version would not be applicable as it is limited to migrate fix number of items for each folder. However, the full license of the software unlock this restriction and authorized user to get the all features of the software. Is the software able to migrate corrupted OLM file? No, Outlook Mac Exporter tool can only export and transfer corruption free OLM to Outlook PST file. What folder structure does OLM File Exporter follow for both OLM and PST file? The same folder structure for both OLM and PST file is to be followed by the Outlook Mac Exporter tool. Will this software be capable of migrating attachments along with emails? Yes, the OLM file exporter tool is capable and can export all emails followed by the respective attachment in it.